Broccoli Cheddar Soup - Fall Favorite! The recent fires in Northern California have sadly affected so many, including clients, friends and associates. While checking up, consoling and doing what I can to help...I'm reminded of how important our ties are; to our family, friends, neighbors and to the people who come into our lives every day to support us. 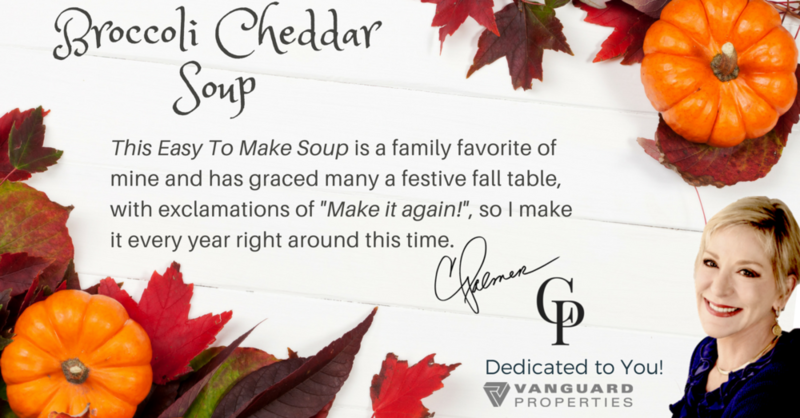 I love to cook and share the food I prepare, so this recipe for you to enjoy with the people who are special to you! Melt butter over medium heat in Dutch oven or soup pot. Add Onion, cook until tender, 5 min. Whisk in flour, cook till golden, 3-4 min., slowly whisk in half and half until smooth. Add chicken broth, bay leave, nutmeg, season with salt and pepper and simmer. Reduce heat to med-low, cook uncovered until thick, about 20 min. Prepare bread bowls: cut a circle in top of each loaf leaving a 1" border. Remove bread top and hollow out middle leaving a thick bread shell. Add broccoli and carrot to broth and simmer about 20 min. until tender. Discard bay leaves. Puree soup in batches in blender, or use immersion blender (When using hot liquid, let cool before transferring to blender - fill 1/2 way, leave corner of cover open, using kitchen towel over top to catch splatters and pulse till smooth). Add cheese to soup and whisk until melted. Add 3/4 c. chicken broth or water if soup is to thick. 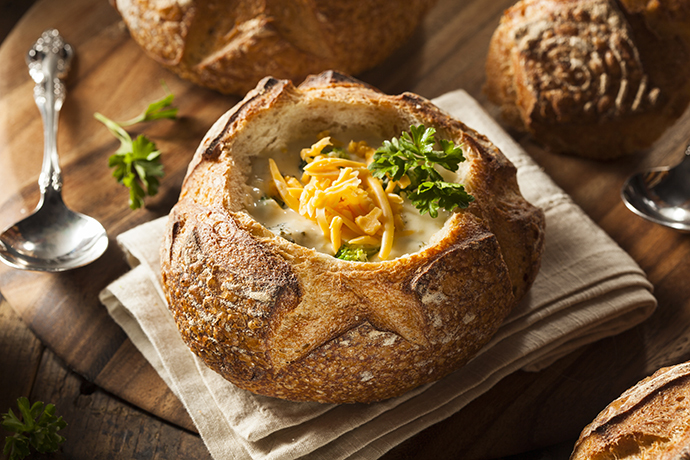 Ladle into bread bowls and garnish with cheese. Enjoy!